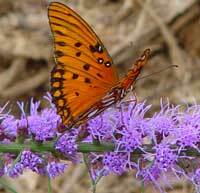 Native Florida wildflowers such as this Liatris are a good source of nectar for Gulf Fritillary butterflies. Within the boundaries of Hillsborough River State Park are 3,738 acres of pine flatwoods, floodplain swamp, hardwood hammock, cypress swamp and ponds. 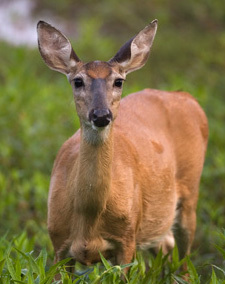 The variety of habitats accounts for the diverse species of wildlife recorded in the park. By protecting this rich ecology, we support birds and animals that visitors may encounter and learn more about. Respect for all wildlife is critical for their health and safety. Friends of the park of all ages can communicate this to visitors when the opportunity arises. 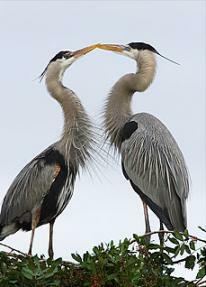 Great blue herons grace the tree tops. Many birds species can be seen in the park; some are residents year round, some only visit in winter. No matter the season, the park offers visitors a chance to observe birds they may not encounter elsewhere, such as the Green Heron, Night Herons, Bobwhites, Woodcocks, Limpkins, Barred Owls, Nighthawks, Downy and Red-bellied Woodpeckers, and Loggerhead Shrikes. Especially in winter you are likely to see any number of warblers, the most common being the Common Yellowthroat, Black-and-white, Palm and Pine, Yellow-rumped and Northern Parula. Interesting mammals to watch for include Marsh Rabbits, Sherman Fox Squirrels, Bobcats, and our River Otters. In summer, visitors watch the night sky for the Seminole Bat, and listen for the Southern Flying Squirrels whose high-pitched squeak may emerge from liveoaks. The park has its alligators, but there are other interesting reptiles in the river system and along the trails. Common turtles in the waterways include the Chicken, Cooter, and Redbelly. On dry land, the shy Mud turtles and our important Gopher Tortoise who shares its burrows with up to 200 other species. You are likely to see Green Anoles, and two types of Skinks. Campers are likely to meet toads and frogs through their calls. If you hear marbles knocking together, this is the Florida Cricket Frog; the sound of a thumb across a balloon is the Leopard frog. Especially after a rain there is a chorus of treefrogs and others who call from temporary ponds. Although there are many snake species documented for the park, those you are likely to see are non-venomous and important to the balance of nature in the park. Southern Black Racers and Yellow Rat Snakes are the most common; if you are lucky you will find the tiny Southern Ringneck Snake, graceful Peninsula Ribbon Snake and Easter Garter.